Back in April you might remember that Belgium declared loot boxes were effectively gambling and therefore illegal in video games. Minister of Justice Koen Geens said publishers could risk prison sentences (up to five years) and fines (up to €800,000) if games with loot boxes continued to be distributed within Belgium. The country was resolute in wishing to protect minors and vulnerable players particularly, from games of chance being squirreled into their computer entertainment. Some time has passed and it appears that gaming industry big guns like Blizzard, Valve, and 2K Games have all disabled loot boxes in Belgium. However, EA have shrugged off the warnings so far and made no changes to the ways its games use this addictive gaming technique. Today there are reports that Belgium's Gaming Commission has opened up a criminal investigation via the Brussels Public Prosecutor's Office, and EA might be faced with going to court. 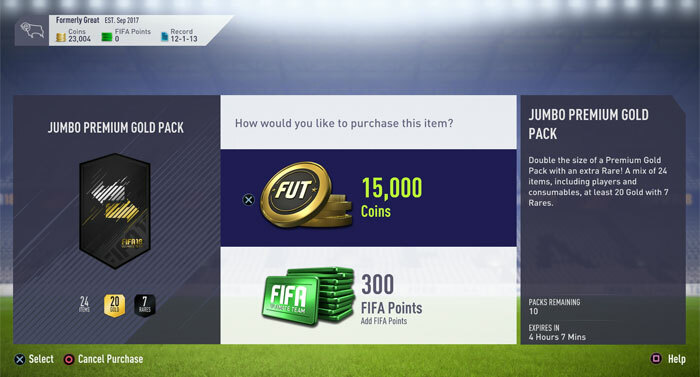 Specifically it has been observed that EA has kept its Ultimate Team card packs in FIFA 18 and upcoming release 19 and has given no indication that it will make changes to comply with the law in Belgium. Based upon previous statements from EA executives, like CEO Andrew Wilson's back in May, EA might be readying for a legal battle over loot boxes rather than giving in without a fight (for this lucrative income stream). As EuroGamer reminds us, Wilson asserted that EA's games were "developed and implemented ethically and lawfully around the world" and that it did not agree that its games could "be considered as any form of gambling." Wilson went on to claim that its 'loot boxes' were not equivalent to gambling as there is no way to cash out or sell loot items for real/virtual currency. GamesIndustryBiz reports that if EA wins the court challenge under existing gambling law, the BGC will seek to change the law to ensure loot boxes are included in its coverage. All they have to do to keep ripping off the idiots that actually pay this money, is to allow players to straight-up purchase the virtual items they want. Taking away the choice or by adding a random variable makes it gambling. Tell ya what, EA. Lets say I have 3 cars for sale. One is worth 10k, one is worth 5k and one is worth 1k. Pay me 10k and I will “randomly” pick one of the cars for you to have in exchange for your 10k. Sounds like a bit of a gamble, doesn't it? I hope they fine them to the point of bankruptcy, I really do.